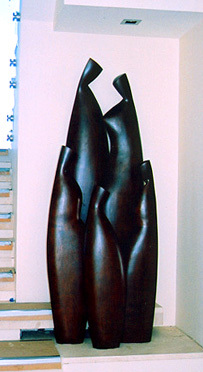 This sculpture is a grouping of five, polished timber pieces. I have used the curved, intersecting forms to gently express the care and unity that can exist between very different people in the same family. Standing up to 1.4 metres high, this sculpture is set upon a limestone stairtread at the base of a staircase.